BANGKOK, June 27 – The private sector today called on the government to seriously concentrate on improving Thailand’s exports and avoid measures that jeopardise private sector business. 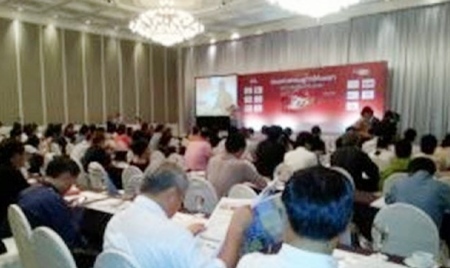 In a panel discussion organised by a Thai business newspaper, Kan Trakulhoon, president and CEO of Siam Cement Group (SCG), said Thailand’s exports in April and May were severely battered by the strong baht and the volatile exchange rate. The US economy shows signs of recovery but isn’t likely to impact Thailand in the near term, he said, adding that China’s economy starts showing signs of troubles. The new Yingluck Shinawatra cabinet, expected to be announced soon, should look into the plight of the private sector which is feeling the pinch from current capital outflows. The baht, whether strong or weak, has a powerful impact on the private sector — which is the major driving force of the Thai economy, he said. Mr Kan said that private sector sentiment will be stagnant unless there is a clear understanding of the government’s Bt2 trillion spending on infrastructure development and the Bt350 billion anti-flood plan. Porametee Vimolsiri, deputy secretary general of the National Economic and Social Development Board (NESDB), said Thailand’s 2013 economic growth will be adjusted from 5 per cent to 4.7 per cent, given the disappointing economic performances in April and May. He warned of possible capital outflows later this year as the global economy has yet to fully recover, adding that Thailand will emphasise tourism development in the second half of this year. Poj Aramwattanont, president of Wales & Co Universe, urged the government’s new economic team to more vigorously supervise the export sector and refrain from adding problems, such as the minimum wage increase and the rocketing baht, onto the private sector. Mr Poj, president of the Thai Frozen Foods Association, said the government’s weak points in its two-year administration should be eliminated and investments for mega projects must be transparent.